Welcome to Creative Knockouts Blog Hop! Hope your week is going great and creative, just as it goes for our Design Team. You should have come here from Carmen's Blog. Don't forget to follow Creative Knockouts in order to win the main prize! I also have a surprise candy for one lucky person, so leave a comment for your chance to win! Сьогодні мій пост - це не лише листівка, а ще й вихвалялка. Колишній блог DDCC уже більше не існуватиме, зате натомість постав новий Creative Knockouts, де я матиму честь творити в чудовій команді (у якій також творитиме і моя найдорожча подруга і кума Марія - щирі вітання!!). Із нагоди відкриття нового блогу та початку найпершого завдання - чоловічі листівки, вся команда дизайнерів вирішила провести для читачів Blog Hop. Це означає, що вам потрібно відвідати всі блоги зі списку нижче й залишити там свої коментарі. Залишіть коментар під цим постом і у вас буде нагода виграти цукерку-сюрприз (дам тільки підказочку, що вона буде різдвяною). Your next stop is Creative Knockouts Blog. Hop over there, leave a comment and join the new challenge! If you do both you will enter for a chance to win a main candy and a prize from the sponsor! Отже, ваша наступна зупинка для коментарів - блог Creative Knockouts! Залиште там коментар і ви отримаєте шанс виграти основну цукерку, а якщо візьмете участь у завданні, то ще й матимете нагоду виграти приз від спонсора. 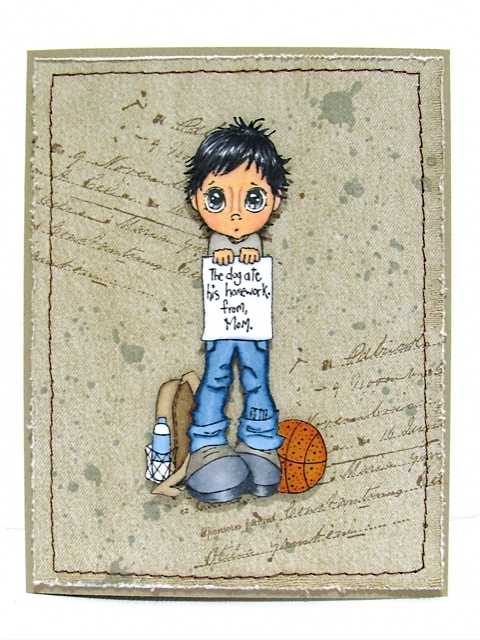 For this Blog Hop and for the first Creative Knockouts Challenge - Masculine Creations - I created a clean and simple card. I used stamps from The Greeting Farm and Unity Co to create background and Homework rubber stamp by Saturated Canary for the image, which I coloured with copic markers. I added some stitching on the edges, adhered my image (oh my, what a piece of work it was to cut it out!) with dimensionals from Stampin' Up! and voila - my card is all done. :) I used Stampin' Up! craft paper and GCD Studios Fub&Funky paper set. I used this Sketch to create my card. У роботі я використала ось цей скетч від Зроби Сама. 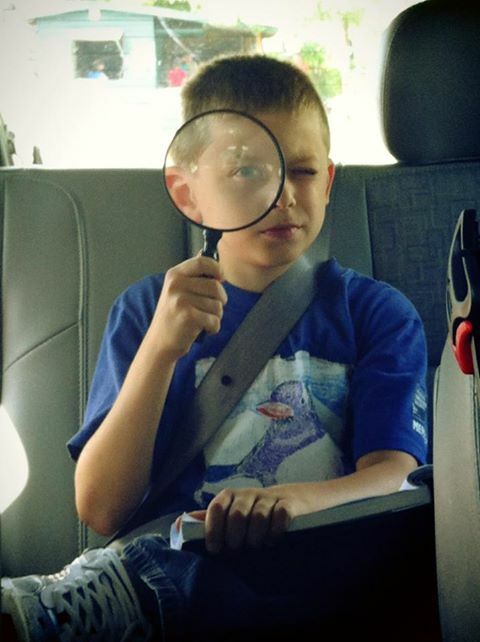 And here's a picture of my 5th-grader. I can't believe he's grown so fast, wow! І ще покажу вам фото свого п'ятикласника. Аж не віриться, що він уже такий дорослий! Have fun hoping and thank you for visiting my blog! Дякую, що дочитали такий довгий пост до кінця! Чудового вам дня! Wonderful Card Lilia... Just checking out everyone's creations... Will head over to the new blog now. such a cute little guy!!! Love the CAS look. Such a cute card Lilia! Love this! sweet card love that image and your coloring is fab! Super cute card. Teriffic coloring. Love the clean simple layout - great card! What a wonderful image - it made me smile. :-) Your colouring is fantastic and I LUV this card. 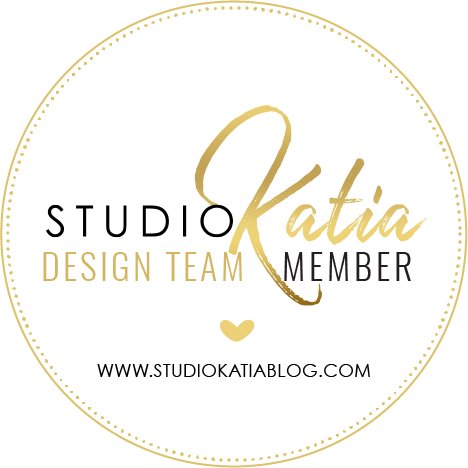 Great idea for the blog hop too, thank you! What a fun card Lila! Love that image. Great blog hop! Hi Lilia, loved to be here .. Wonderful coloring! Thanks for participating in the http://www.7kidscollegefund.com challenge! love sweet image. Beautiful card! Thank you for joining our CAS Challenge at The Paper Nest Dolls. Wow, this is a beautiful card! 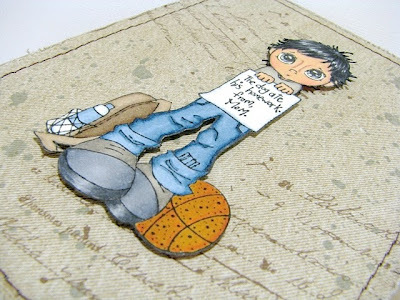 Adorable card for a little man (boy). I love the image and your paper choices! Thanks for sharing with us at Cards in Envy! Super job coloring the image - and fussy cutting it too? WOW! I like the stitching around the edges too. Thanks for joining in the Manly challenge at Cards in Envy! What a fabulous card, love how your image just pops off the card and I love the little note he is holding that's priceless!! Thanks for joining our C&S challenge over at The Paper Nest Dolls Challenge Blog! Love this look! Thank you for joining our Clean and Simple Challenge at The Paper Nest Dolls. a fantastic card with an awesome colouring! Great image! Love that background paper too! Thanks so much for playing with us at LRW!! A great masculine card. Love your fussy cutting. Thanks for playing with us at Cards in Envy. 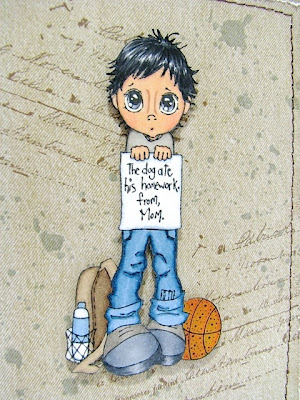 Thanks so much for playing along with us this week for the Paper Nest Dolls "CAS Challenge” with us! Just loved your card, and hope to see you back here for our next challenge! wow!!! I totally LOVE that image!!!! sooo glad you played along with Cards in Envy!! !